This herbal formula is designed to help improve the condition of the respiratory system. Note: At a full dosage one bottle of Soup B in capsules is a 7 day supply, one bottle of liquid is a 14 day supply. 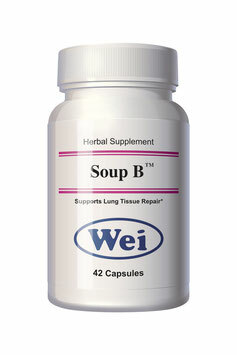 Soup B is used often in challenging condition and it supports the action of Soup A. Soup B is designed to help people with various respiratory conditions to deal with the underlying condition behind low oxygen levels and chronic cough or irritation*. Available in liquid: contains 850ml. Needs refrigeration at all times. One bottle of liquid is a 14 day supply, if taken at manufacturer's full recommended dose of 2 TBS, 3 times per day.